Ganglines are made with hollow-braided poly rope with ¼" tug and neck lines, 3/8" center lines. ½" swivel snaps are used at necklines and 5/8" on tuglines. All ganglines are sold in two dog sections with easy to replace necklines and tuglines. Recommended for beginners and small team drivers. All necklines and tuglines may be used separately or together to run any combination of 1 to 4 dogs. Double or single lead. Double neckline included. With replacement necks and tugs you re-use snaps. Use with carabiner; loop to gangline base to lessen the jolts, allow for smoother pedaling, and to increase dog's comfort. Base price is for 1 - 6 dog teams. Use the following with 2 carabiners; Doubles Loop Section. For larger teams, upgrade to Aircraft Bungee. Locking Carabiners are sold separately. Used to increase the size of a gangline for an additional 1 or 2 dogs. Many other uses, including on-trail repairs. Experienced drivers always carry spares. Base price is for a Single Neckline. 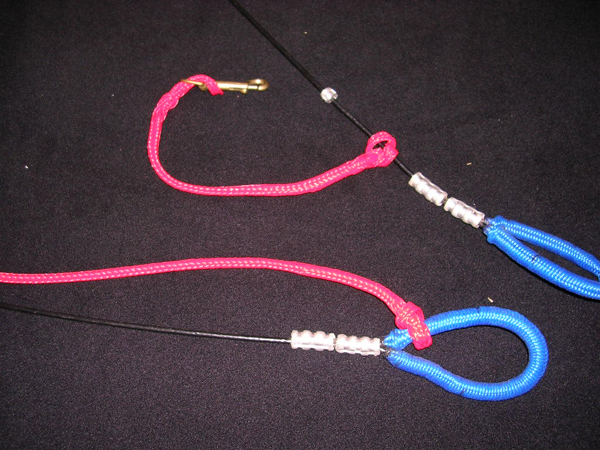 Cable Ganglines – Ganglines are made with hollow braided polyrope with ¼” tug and neckline. The center line will be made of 5/32” spacelay cable. ½ inch Italian Bronze snaps are used at necklines and 5/8” Italian Bronze snaps are used on tuglines. All ganglines are sold in 2-dog sections with easy-to-replace necklines and tuglines. The benefit of cable centerlines is more secure winter camping and some long distance races require cable centerlines.